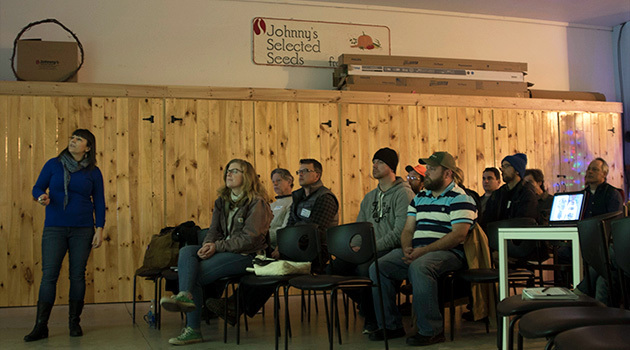 Albion, Maine: December 7, 2016 — Johnny's Selected Seeds hosted Lane Selman, Founder & Director of the Culinary Breeding Network in Portland, Oregon, as guest speaker at its Research Farm in Albion, Maine. Selman's visit was well-timed, following Johnny's first Seed-to-Table Variety Tasting in September. 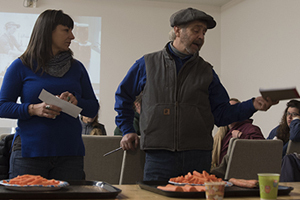 Present at the day-long series of presentations, culinary tastings, and discussions were employee-owners of Johnny's, along with local chefs and farmers, as Selman inspired the group with her story about how the Culinary Breeding Network developed in the Pacific Northwest. Many models exist for involving farmers in the breeding process, such as gathering farmer input to set breeding goals, variety trials, and participatory plant breeding, but fewer models for involving chefs in that process. There is a vibrant farm-to-table scene in the Northeast, but the plant breeding side is underrepresented. As plant breeding supplies growers with improved cultivars for flavor, resiliency, sustainability, and yield, the Culinary Breeding Network's partnerships align well with Johnny's 40-year history of breeding and trialing with the input of organic growers and researchers across the US.
" Do you know where the seed comes from? Do you know what variety it is and who created it? Most people do not. It's the door behind the farm. In this room, you will meet some of those people. The plant breeders. " With this flavor wheel used for bourbon tastings, Selman provides an prototype for developing a winter squash lexicon. Characterizations of the Winter Squash Eating Experience share features with the enjoyment of alcoholic beverages such as bourbon or wine (Sweet & Fruity, Sweet & Rich, Savory & Musky). A key culinary characteristic for squash is best application (Raw, Steamed, Roasted). Equally important is whether and how long to store varieties before they reach peak eating quality. (See Johnny's Winter Squash Comparison Chart. Tasters get down the preferential business of evaluating, "I like this … but not that." … AND a whole lot of fun. By inviting the public to tasting "parties" Selman is able to draw a wider audience.